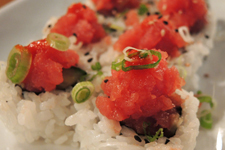 Tuna sea­soned with Asian hot sauce, cucum­ber and daikon sprouts. Can be made as chopped tuna by request for $2 upcharge. 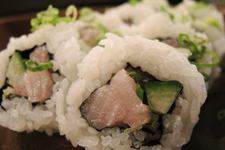 Fresh yel­low­tail and crisp cucum­ber in sea­soned rice and toast­ed sea­weed.